A comprehensive step by step tutorial on building Ionic 4, Angular 6 and Cordova CRUD (Create, Read, Update, Delete) Android and iOS Mobile App. We will access RESTful API or web service that previously we create on Node.js, Express.js and PostgreSQL tutorial. For this tutorial, we are not using all RESTful API for CRUD, we just use a Classroom API only. We write this tutorial because we are curious about the new feature of Angular 6 when using it in Ionic 4 app. You will get the latest Ionic CLI pro 4.0.0 in your terminal or command line. To create a new Ionic 4 and Angular 6 application, type this command in your terminal. As usual, run the Ionic 4 and Angular 6 app for the first time, but before run as `lab` mode, type this command to install `@ionic/lab`. 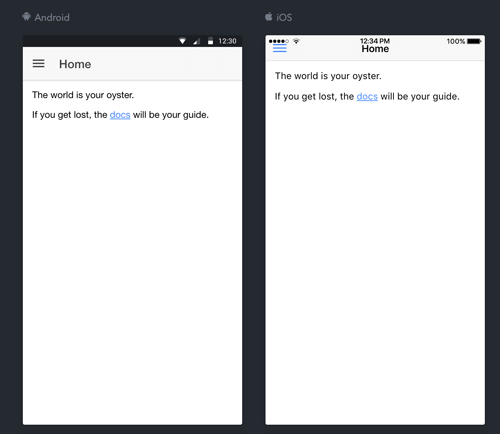 Now, open the browser and you will the Ionic 4 and Angular 6 app with the iOS, Android, or Windows view. To separate the presentation data from data access, we have to create a service for accessing RESTful API from our server. Before modifying the service file, open and edit `src/app/app.module.ts` then add this import. Then add this module to the `@NgModule` imports. Next, open and edit `src/app/rest-api.service.ts` then add this imports. Add constant variable before the `@Injectable` annotation. That constant variable shows the long URL for API because we need to use `corsproxy` for accessing non-CORS enabled server. For that, install the `corsproxy` first by type this command. Next, inject `HttpClient` to the constructor params. Add the functions for handle error and extract response data. Next, add all CRUD (Create, Read, Update, Delete) function for accessing CRUD RESTful API from the server. We will put the list of classroom data in the existing home page. To view the list of the classroom from RESTful API that previously handles by the service, open and edits `src/app/list/list.page.ts` then add this imports. Inject the `RestApiService` to the constructor params. Remove all default generated variable, function and constructor body then add this variable before the constructor for hold classroom data that get from the service. Add this function for getting the list of the classroom from the Rest API service. In the Angular 6 `ngOnInit` lifecycle hooks call that function. Next, open and edit `src/app/list/list.page.html` then replace all HTML 5 tags with this. As you see, there's a `routerLink` to the details page that we will create in the next step. To create detail page for view details of the classroom that pick from classroom list, type this command. We have to modified detail route by open and edit `src/app/app-routing.module.ts` then make the detailed route like this. Next, open and edit `src/app/detail/detail.page.ts` then add this imports. Inject that imported module to the constructor params. Declare a variable before the constructor for hold the response from API. Create a function for getting classroom detail data from REST API service. Modify `ngOnInit` function to call above function. Add function for delete data. Next, open and edit `src/app/detail/detail.page.html` the replace all HTML 5 tags with this. 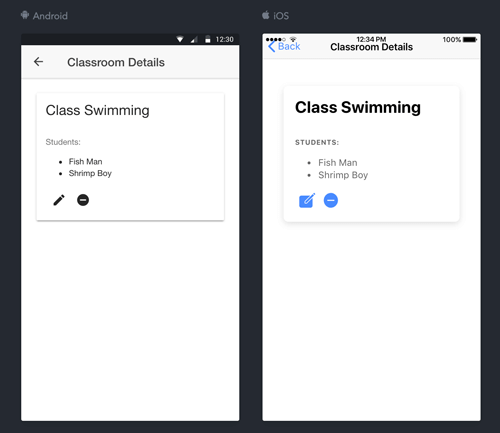 Same as the previous step, type this command to generate an Ionic 4 page for edit and update classroom data. Open and edit again `src/app/app-routing.module.ts` then add params to edit the route. Next, open and edit `src/app/edit/edit.module.ts` then add or modify this import. Add `ReactiveFormsModule` to `@NgModule` imports. Next, open and edit `src/app/edit/edit.page.ts` then add this imports. Inject above modules into constructor params. Add these variables before the constructor. Create a function to get Classroom by ID from REST API service. Initialize the form group by adding it to the body of the constructor. Add the functions for adding form array and delete an item from the form array. Add function for saving classroom data by post the form data to REST API service. Next, open and edit `src/app/edit/edit.page.html` then replace all HTML 5 tags with this. 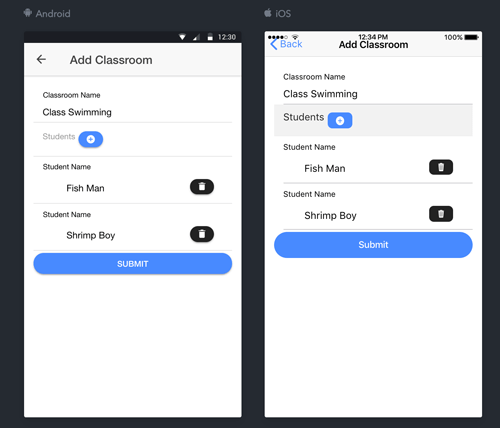 Same as previous step, type this command to generate an Ionic 4 page for add and save classroom data. Next, open and edit `src/app/create.module.ts` then add or modify this import to add `ReactiveFormsModule`. Add this `ReactiveFormsModule` to `@NgModule` imports. Next, open and edit `src/app/create/create.page.ts` then add this imports. Inject that modules to the constructor params. Add a variable of `FormGroup` and `FormArray` before the constructor. Initialize the classroom form inside the constructor body. Add the functions for adding an item to the form array. Also for remove item from the form array. Next, add the function to post the form data to the REST API service. Next, open and edit `src/app/create/create.page.html` then replace all HTML 5 tags with this. Finally, open and edit `src/app/list/list.page.html` then add this button to the toolbar for open above page. First, we have to run the Ionic 4 and Angular 6 app to the browser. Type again this command to test, make sure you have run the recommended RESTful API server and `corsproxy`. It will automatically open the browser and show the main page of the app. 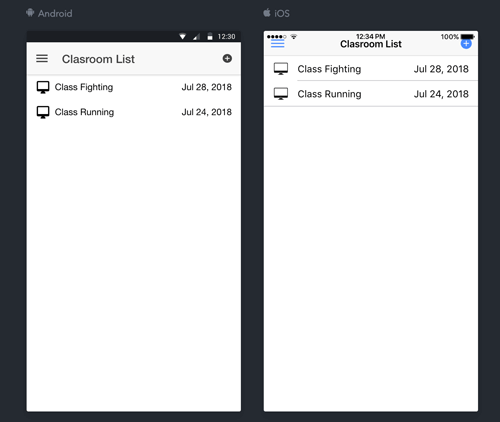 Just navigate the app menu to find out the classroom list, detail, create and edit data. To run on iOS Device/Simulator, add the platform then build and run from XCode. If you have the problem when running this app to simulator or device. Try removing the `WKWebView` by type this command. 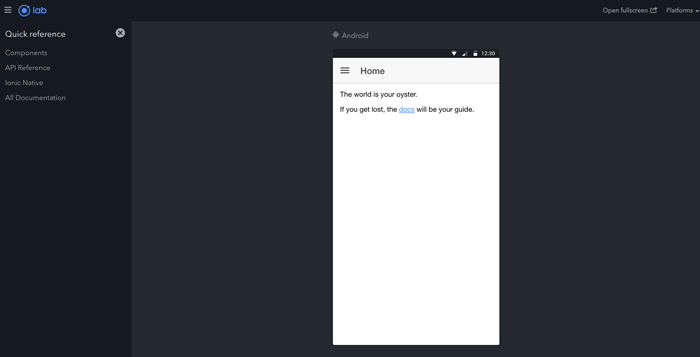 To run on Android Device/Simulator, add the platform then build and run the app. Of course, you will get a lot of bugs or errors, because this is the beta version which still reviews and bugs findings and reporting. You can raise an issue here after there's no same issue exists. That it's, the comprehensive step by step tutorial on building Ionic 4, Angular 6 and Cordova CRUD (Create, Read, Update, Delete) Mobile App. You can find the full source code in our GitHub.